The Digital Natives team – Back row from left, Trent Mankelow and Kerepeti Paraone. Front row from left, Nathan Pere, Hana Mereraiha, Sampson Karst and Hori Mataki. As Hori Mataki reflects on how far he and the Digital Natives team have come in the development of IwiNet, he is excited about the potential technology has to connect every Māori with their whānau. “For us, it has always been about finding a way to use technology to overcome the sense of dislocation and identity loss that many Māori feel,” says Hori. IwiNet is a web and mobile-based application that aims to connect every Māori with their whānau, hapū and iwi, and with all the initiatives and opportunities available to them. Iwi and hapū will have direct access to their members in real time via internet and mobile devices, making IwiNet a powerful tool – a world first in fact – for measuring engagement, participation and outcomes for whānau and hapū. The idea of IwiNet came about as a group of young Māori working in the technology and design arena sought to use their skills to help other whānau. They joined forces with other young Maori working in the trades and in education and called themselves the Digital Natives. Their aspiration was to demonstrate to rangatahi in particular, that it is possible to be successful in business as Māori and maintain your values at the same time. 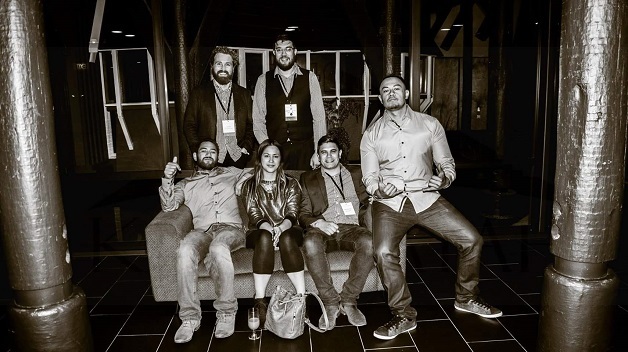 Hori Mataki (Te Whānau-ā-Apanui, Ngāti Porou, Ngāi Tahu), has been designing for the last decade, for around fifteen different iwi through his company, Ariki Creative; and along with fellow digital natives Sampson Karst (Ngāi Tahu, Tainui), Nathan Pere (Tainui), Hana Mereraiha (Tainui, Ngāi Tahu) and Kerepeti Paraone (Ngāi Tahu), began brainstorming the IwiNet idea around three years ago. “We were motivated by empowering Māori to reconnect and engage with their tribal identities in a new and modern way,” says Hori. Digital Natives applied for Te Pūtahitanga funding to support the development of IwiNet, situating the project within Hori’s existing digital design company, Ariki Creative and Sampson Karst’s company Manu Media. Their application was successful in the January 2016 funding round and since then, the team has been working hard to refine the application’s development. They have divided the project into two distinctive parts, funding and development. The initial phase was to source sufficient funding to underwrite the project. This has been achieved and they are now focused on further developing the project. They have completed the design logic and are now working with Sush, a team of developers in Auckland to create the application. As the project progresses whānau are testing each stage of the development prior to trialling more widely. In order to evaluate their success, the Digital Natives have identified a series of measures that they hope to achieve within the first year. These include completing the development of the IwiNet platform, recruiting Te Waipounamu iwi and producing and delivering data analytics to iwi. In the long term they hope to track the number of individuals who register, monitor how active they are, and engage additional iwi from across Aotearoa. Hori says the project has been a challenge from the outset. “It’s a complex initiative and it’s sometimes taken persistence and commitment on our part to get other people on board. It’s pushed us, it’s challenged us but that has made us push our own boundaries as a team and that has been the biggest reward,” he says. “And without Te Putahitanga’s belief in us, we wouldn’t be where we are today. Their funding has enabled the development process to be accelerated. By securing start-up funding we’ve have been able to dream big and keep our vision of an innovative, nationwide pan-iwi platform alive.